"Got this recipe from a friend WAY back in junior high. Super simple and tastes delicious. My kids ask for it all the time. If you love enchiladas, you'll love this recipe. You can use any flavor Doritos® to suit your tastes. When reheating leftover casserole, stir in a little bit of milk to make it creamy again." Cook and stir ground beef in a large pot over medium-high heat until the beef is crumbly and completely browned, 7 to 10 minutes. Drain and discard excess grease. Stir cream of chicken soup, enchilada sauce, and milk with the ground beef; bring to a simmer and cook for 5 minutes. 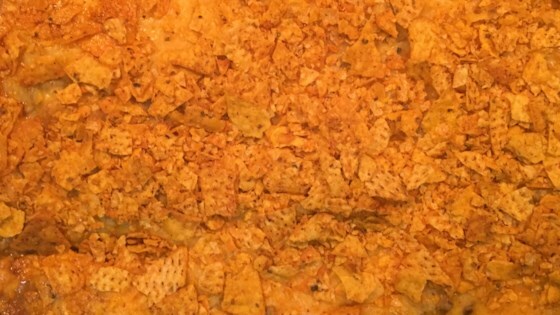 Spread crushed tortilla snack chips into a 9x13-inch baking dish. Pour ground beef mixture over crushed chips; stir. Arrange cheese slices atop the mixture. Bake in preheated oven until the cheese melts, about 5 minutes; stir the melted cheese into the beef mixture. This is OK. It is fast and easy, and all of the ingredients are usually things I have on hand. Next time, I will add a can if diced tomatoes, and some onion with the ground beef/turkey. My family loves this recipe. I use cream of mushroom soup instead of the cream of chicken. I also add a small can of diced chilis to the meat mixture. My kids ask for this all the time! So unhappy with our dinner tonight. I wish people wouldn't rate the recipes that they changed from the one offered. I followed this recipe exactly and thought it was completely bland. Put shredded cheese on top instead of slices.